★ Info about the Sydney Harbour Bridge. You can have a close hand look while you are in Sydney by visiting the South Eastern Pylon. It is a walking trip and recommended for the fit only. It is a longish walk to get to the base of the Pylon and then there are 200 steps to the top. Entry for adults is now $8.50 (23 June 2003), kids between 8 and 12 years three dollars and under 8 years its free. (Prices valid until 30 November 2003). Hello inflation now (April 2017) its Entry for adults is now $15.00. Children (5 to 12 years) $8.50 Concession (Seniors & Student) $10.00 and Children (4 years and under) Free. The views and photo opportunities are fantastic. (If you can make it, we've got to say it is tough). There is a great display on how the thing was built. It has a similar place in Sydney history to the Statue of Liberty in New York as far as many migrants to Australia go. In sight of the bridge you knew you had made it. The displaced peoples of Europe who came to Australia in the days of the grand ships can get very misty when you ask them what they felt when they saw this grand old arch on their arrival in Sydney from the aftermath of World War Two as they sailed up Port Jackson (Sydney Harbour). The old Bridge has been replaced as "the" landmark of Sydney by the bold architecture of the Opera House. But a grand old bridge it is, and one you will remember whenever you think of Sydney after your visit. When it opened it cost a car six pence to cross. A horse and rider was 3 pence. These days a return trip (for some reason the only kind) costs two dollars twenty (gst). Horses and riders are banned, that's the changing times. You can walk across free and you are allowed to bicycle in a special lane. Sydney Harbour Bridge is the world's largest (but not longest as thats the New River Gorge in the USA) steel arch bridge, and, in its beautiful harbour location, has become a renowned international symbol of Australia. Its total length including approach spans is 1149 metres and its arch span is 503 metres. The top of the arch is 134 metres above sea level and the clearance for shipping under the deck is a spacious 49 metres. The total steelwork weighs 52,800 tonnes, including 39,000 tonnes in the arch. The 49 metre wide deck makes Sydney Harbour Bridge the widest Longspan Bridge in the world. It now carries eight vehicle lanes, two train lines, a footway and a cycleway. After inviting worldwide tenders in 1922, the New South Wales Government received twenty proposals from six companies and on 24 March 1924; the contract (for Australian 4,217,721 pounds 11 shillings and 10 pence!) was let to the English firm Dorman Long and Co of Middlesbrough. The general design was prepared by Dr J.J.C Bradfield and officers of the NSW Department of Public Works, while the detailed design and crucial erection process were undertaken by the contractors consulting engineer Mr (later Sir) Ralph Freeman of Sir Douglas Fox and Partners and his associate Mr. G.C Imbault. Some other designs that where not choosen can be found here. 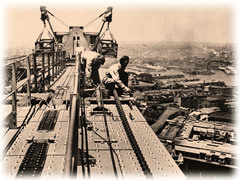 As Chief Engineer of Sydney Harbour Bridge and Metropolitan Railway Construction from 1912, Dr Bradfield is regarded as the "father" of the Bridge as it was his vision, enthusiasm, engineering expertise and detailed supervision of all aspects of its construction which brought Sydney's long held dream into reality. The contractors, under Director of Construction, Lawrence Ennis, set up two workshops at Milsons Point on the North Shore. Here, the steel (79% imported from England, 21% from Australian sources) was fabricated into girders etc. 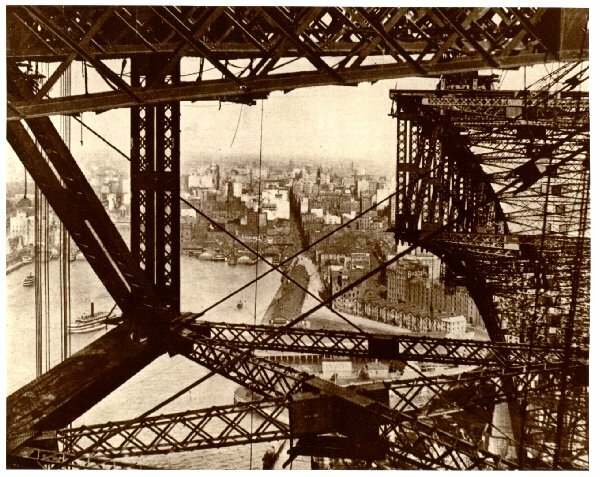 The foundations for the four main bearings, which carry the full weight of the main span were dug to a depth of 12.2 metres and filled with special reinforced high-grade concrete laid in hexagonal formations. The four impressive, decorative 89 metre high pylons are made of concrete, faced with granite, quarried near Moruya, where about 250 Australian, Scottish and Italian stonemasons and their families lived in a temporary settlement. Three ships were specifically built to carry the 18,000 cubic metres of cut, dressed and numbered granite blocks, 300km north to Sydney. After the approach spans were erected, work began on the main arch. Two half-arches were built out progressively from each shore, each held back by 128 cables anchored underground through U-shaped tunnels. Steel members were fabricated in the workshops, placed onto barges, towed into position on the harbour and lifted up by two 580 tonne electrically operated creeper cranes, which erected the half-arches before them as they travelled forward. 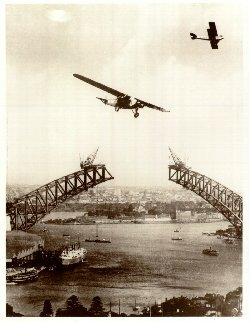 There was great excitement on 20 August 1930 after the arch was successfully joined at 10pm the night before. 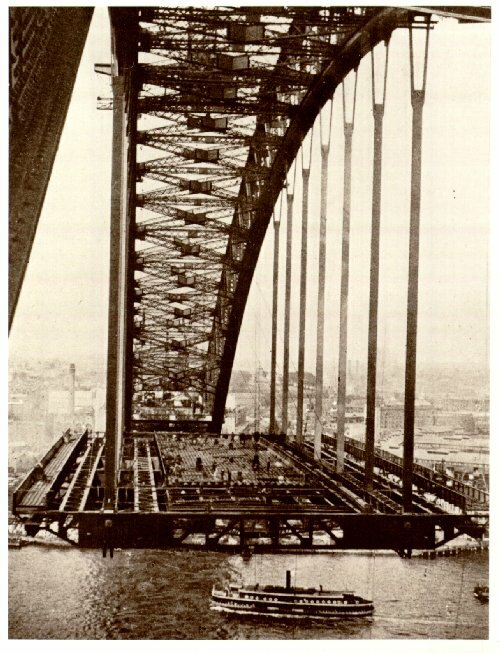 The steel decking was then hung from the arch and was all in place within nine months, being built from the centre outwards to save time moving the cranes. 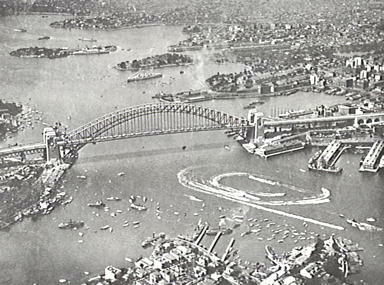 As the project neared completion, the last of approximately six million Australian made rivets were driven through the deck on 21 January 1932. 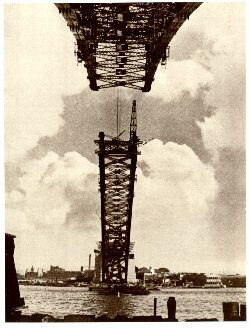 In February 1932 the Bridge was test loaded using up to 96 steam locomotives placed in various configurations. 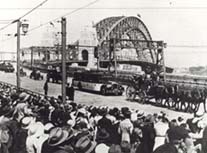 The official opening day on Saturday 19 March 1932 was a momentous occasion, drawing remarkable crowds (estimated between 300,000 and one million people) to the city and around the harbour foreshores. The NSW Premier, the Hon. John T. Lang, officially declared the Bridge open. However, the Premier enlivened proceedings when Captain Francis De Groot of the para-military group, the New Guard, slashed the ribbon prematurely with his sword, prior to the official cutting. This incident caused both amusement and dismay on the day and has since become part of Australian folklore. The opening celebrations included a vast cavalcade of decorated floats, marching groups and bands proceeding through the city streets and across the deck in a pageant of surprising size and quality, considering the economic depression. an event not repeated until the 50th anniversary of the Bridge in 1982. Some enthusiastic ones celebrated by unofficially climbing up the arch. 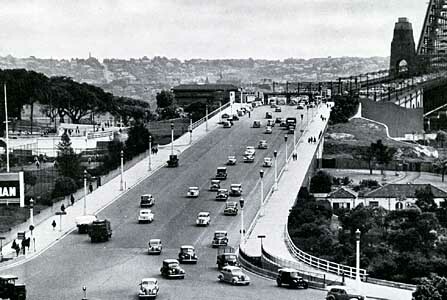 The Harbour Bridge is an essential artery feeding traffic to and from Sydney. Below our traffic statistics and facts and figures. Below some more ancient pictures that where taken a long time ago 'probably' during the construction. I got these pictures from someone else who scanned them in for me. Thanks mate.. If someone else has other nice pictures please let me know so the collection can be further increased. The cranes had played a very important part in both the construction and ongoing maintenance of the bridge. During construction of the main arch between 1929 and 1931, two huge creeper cranes moved outwards, laying their tracksas they progressed. 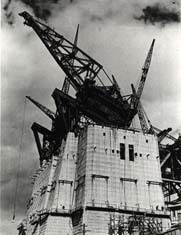 Behind them moved the four maintenance cranes, used initially by the riveting and painting gangs until they had to be dismantled to allow the creeper cranes to pass by and be removed in pieces near the pylons. 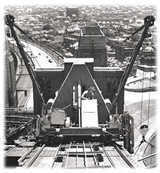 The maintenance cranes were then re-erected on the arch and remained in service until their removal in 1997. Paint required 272,000 litres of paint were required to give the Bridge its initial three coats. At one time actor and comedian Paul Hogan was a rigger on the bridge before finding fame and fortune. In June 1976, the one-billionth vehicle crossed the Sydney Harbour Bridge. The first 500 million crossings took over 33 years while the second 500 million took less than 11 years. In 1932, the annual average daily traffic volume (in both directions) was about 10,900. In 1943, with a wartime shortage of vehicles and petrol rationing, there was a drop in traffic to about 8,600 vehicles a day. Make your own map selection. Some fotos from Sydney and the Harbour bridge. 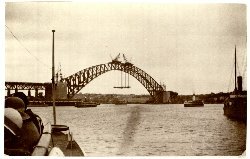 Historic picture collection (select 'Harbour Bridge'). Some other great bridges in the world. Sydney Harbour Bridge, approaches and viaducts. A few visits to Sydney.. 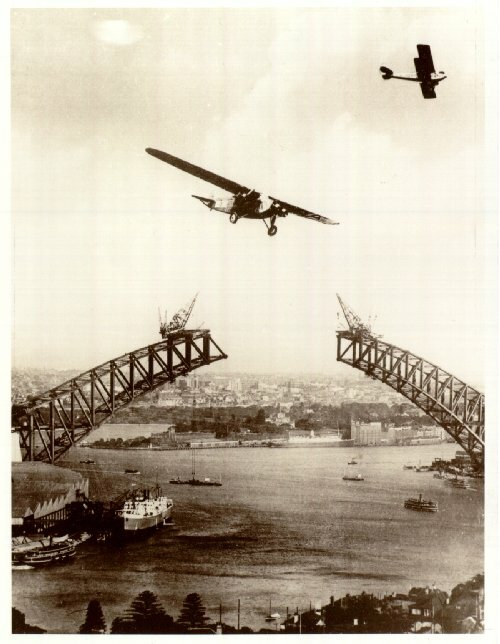 Many photos of the Sydney Harbour Bridge. 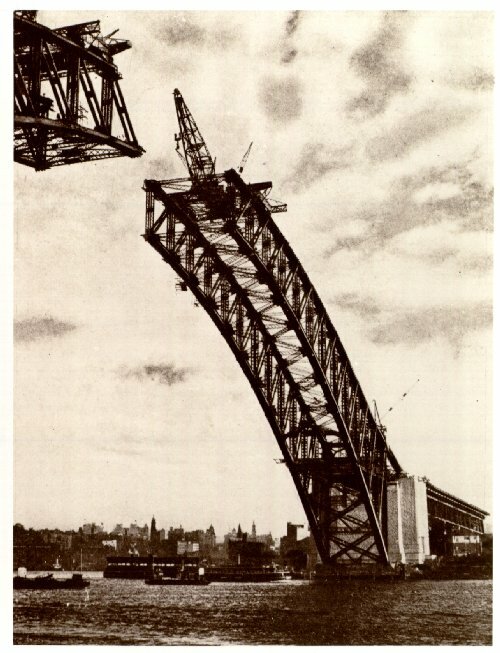 The Construction of Sydney Harbour Bridge.